Do you use Facebook for business? Looking for new ways to show off your products on Facebook? You can do more than posting photos to your facebook page to get more customers and prospects to see your products. A user-generated content (UGC) campaign is all about asking for and sharing your customers’ content. People love taking photos and videos of the stuff they love, so treat each sharer like a brand ambassador. Whether customers are wearing, using, or just chatting about your products, their photos and videos can showcase your products in an authentic way and help you reach a wider audience. UGC also gives current customers new ideas for using your products and helps inspire prospects to make a purchase. The best way to get UGC is to come right out and ask for it. For example, you might offer fans an incentive to post photos, such as a giveaway contest where people need to take a photo with your product to enter. You could also offer a special discount for fans who share their photos on Facebook using your campaign hashtag. It’s all about letting fans know you want to share their content. 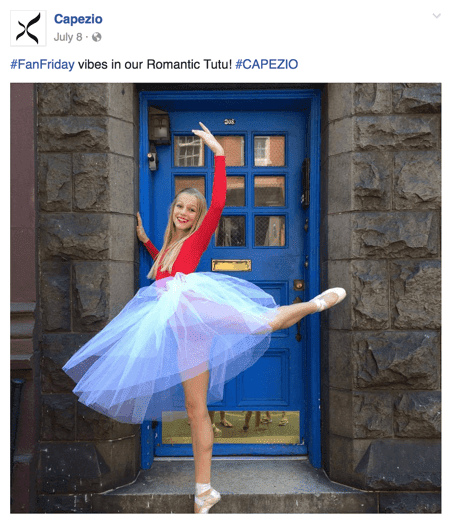 Dance brand Capezio shares user-generated content on their Facebook page using the hashtag #FanFriday. In addition to Facebook, you can solicit and share UGC on other social channels, such as Instagram, Twitter, or even YouTube. If you need some assistance, a platform like Yotpo can help you request photos, videos, Q&As, and reviews. Sixty-two percent of customers say they want content from brands that shows how to use their products. You can satisfy that need and share some creative ideas for your products with video. 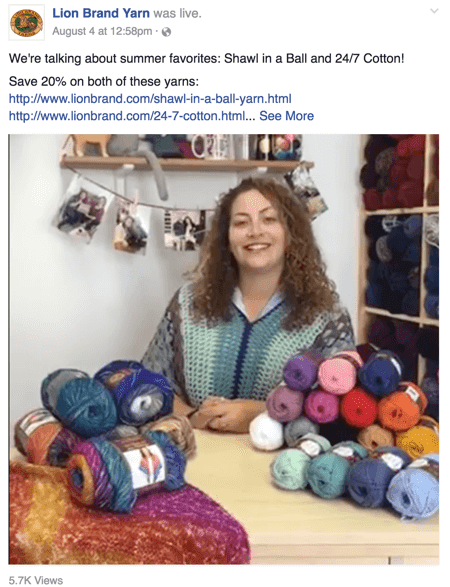 Lion Brand Yarn uses Facebook Live video to promote sales, highlight specific yarn, answer customer questions, and share great patterns. The best part is that they do it without using any fancy effects or production. The videos feature one employee in a simple showroom setup, speaking frankly and humorously about what she makes and how Lion Brand Yarn’s products can be used. It’s not as hard as you’d imagine to start a video series. Here’s how Lion Brand Yarn does it on their page. In your own videos, you can simply show your products and explain how to use them. You might also demonstrate how other people have used them (incorporating UGC) and give valuable and inspirational lifestyle tips that fit with your product line. Customer referrals are one of the best ways to reach people who share common interests with your current customers. If you want to start a loyalty program for your business, look for a program that allows you to reward a variety of customer actions. Among those actions, you should be able to reward customers for referring friends to your business by sharing your page with their Facebook friends. Now that’s a great reason to share! Look for a loyalty program that allows you to reward customers for sharing your products and bringing in referrals on Facebook. 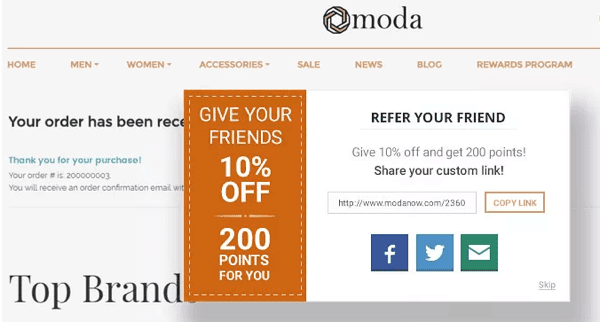 With a loyalty program, you can reward those who make a referral, and give a discount to their friends who take action through the shared link and make a purchase. If you don’t have the budget or time to build your own program, there are third-party developers, that make it easy to create one. If you’ve already built a great following on your Facebook page, don’t be afraid to ask your fans for a rating or review on your page. Just be sure to do it in a non-intrusive way and without offering incentives, to follow Facebook’s Community Guidelines. Powell’s Books has an excellent 4.8-star review rating with a staggering 10,000+ reviews. How’s that for building trust? 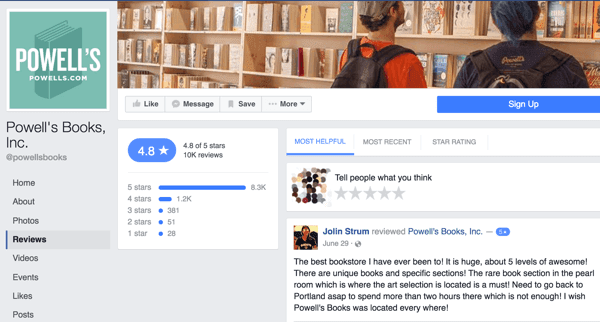 Even just a few 5-star ratings can do a lot for your Facebook page and improve your search engine results. Reviews can show up in search results when people are searching for more information about your business. That’s especially important when most shoppers are doing their research and say that reviews have an impact on purchase decisions. If you don’t see a Reviews tab for your page, go to your page and click the Settings link. On the General Settings tab, click the Reviews link and select the Allow Visitors to Review This Page option. Be sure to click Save Changes when you’re done. Select the option to allow visitors to leave reviews on your page. Once you’ve done this, a Reviews tab will appear for your page, allowing your page visitors to leave reviews of your business. Once you enable reviews, you’ll see the Reviews tab on your page. If you’ve already built a great following on your Facebook page (or have a few special clients who are your brand advocates), take time to thank your fans for their business. Be sure that you respond promptly to inquiries on Facebook and try to provide little surprises to customers from time to time. If you want an even faster way to get more facebook likes, you can buy facebook post likes or buy facebook page likes with FastFaceLikes. Retargeting ads and lookalike audiences are great news for ecommerce, especially when it comes to posts about new products or promoting existing product pages with the Website Clicks ad format. You can use your own company data to target audiences similar to your current buyers. If you’ve collected email addresses from your customers, import your list of email addresses into Facebook to create lookalike audiences. It’s a great way to target similar demographic profiles. Keep in mind, however, that some of the email addresses you have on file may not match the email addresses in people’s profiles. If you have the Facebook pixel installed on your website, you can create an audience from the customers who have made purchases or completed other actions on your site. Retarget people who have already shown an interest in your product. For example, maybe you want to promote products that customers added to their cart but didn’t actually purchase. You can use retargeting to show those products to people who are already interested. These five tips will help you build trust, grow your audience, and increase overall brand engagement. So start planning a new video, collecting UGC, and creating Facebook ads that highlight what you’re selling and why it’s useful to your customers. What do you think? 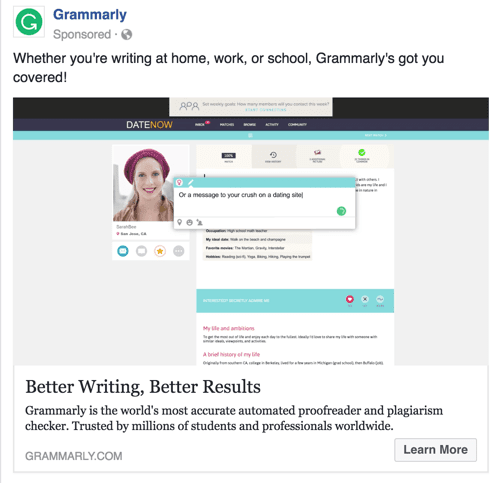 How are you using Facebook to shine the spotlight on your products? Please share your thoughts in the comments below. Zsuzsa Kecsmar - Author - Thanks for this great article!